Synopsis, Our Opinion: A well balanced and juicy California Cabernet. 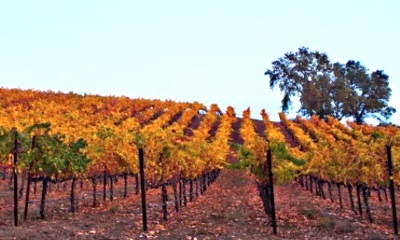 Geographic Appellation: Willow Creek District; Paso Robles; Central Coast, California. 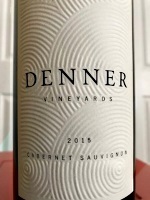 Purchased From: Denner Vineyards tasting room; Paso Robles, California. Paired With: Grilled lamb kebabs with Middle Eastern spices, mashed potato with red wine gravy and roasted brussels sprouts. Opened and decanted one hour before drinking. Opaque, inky dark purple color with the same color rim. Dark fruit aroma dominates with a vibrant floral background that immediately remind both of us of the climbing Rosa ‘Casino’ (there were also hints of alcohol on the first pour). Velvety smooth entry, lush & juicy, full body (but, light mouth-feel) and a 200-grit texture. Abundant and vivacious blackberry and plum flavors with a slight smoky taste that remained strong from start to finish. Fresh acidity, outstanding well structured round-edged tannins and an especially long tart, jammy finish. WOW, WOW, WOW we were impressed with the dry fruity taste and every sip was satiny smooth. Great paired with the strong lamb flavors and even better as a sipping wine after the dinner It was a well balanced and juicy California Cabernet. Not inexpensive, but an unusual really easy drinking Cab.